Obstacles Welcome outlines a simple set of strategies for people at every level of society who face challenges in their businesses, education and personal lives. First, de la Vega says, when faced with a challenge we must assess the situation, examining our strengths and weaknesses. What do we already have going, and how can we improve on it? What do we need to do to eliminate our deficiencies? Next, we must establish a vision, what we have decided we are going to accomplish. We can find this vision in the problems we encounter, what de la Vega calls “opportunities in disguise.” This vision need not be huge, but it must inspire excellence. “People limit themselves by believing they are less than they really are,” he explains. Third, we must create a plan for success, listing the steps necessary to make the vision become reality. “Hope,” de la Vega points out, “is not a strategy.” Then we must amass the people and resources to carry the plan forward. When people know their effort is valued and their opinions heard, they are more likely to commit themselves energetically. Finally, we must put the plan into effect, monitoring and adjusting it with incoming information as we progress toward the goal, keeping in mind a solid foundation of values. Ethical practice is not only “the right thing but the wise thing to do,” de la Vega declares. Certainly his ideas are applicable to business practice. A study of AT&T Mobility’s success in the years since de la Vega has assumed the lead in various positions demonstrates this fact. His achievements include reconstructing Florida’s AT&T telecommunications network following Hurricane Andrew; rolling out BellSouth’s broadband services from 30,000 to 600,000 customers in 2000; unifying and revamping telecommunications in 11 countries for AT&T Latin America to the point that the region produced a profit for the first time; and running the cash merger between AT&T Wireless and Cingular Wireless to create AT&T Mobility. 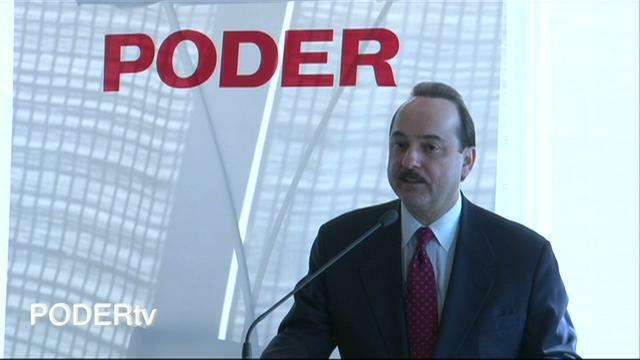 De la Vega met with PODER in a conference room at AT&T’s Atlanta corporate office building, whose clean, sweeping interior vistas mirror and support the forward-thinking vision of the company. De la Vega himself is courteous and friendly, sporting a mild blue business suit that belies his passion for work and for helping others, especially young people. This enthusiasm becomes evident when he begins to speak. [PODER enterprise] What made you decide to write a book? [Ralph DE LA VEGA] People told me I should write my story, that it could be inspirational. I started setting down my experiences in chronological order, and, at first, it just seemed bland. The concept of the book changed at that point, so that instead of it being a book about me, it became a book about helping readers. I infused each major section with a story that illustrated the main ideas, and added pictures to help audiences remember key arguments. Then my editor at Thomas Nelson re-arranged the chapters so readers could get more out of it, moving from one salient point to the next, rather than waiting until the end to get useful information. [Pe] Many high school and college students give up on education. What can parents and society do to help raise more Ralph de la Vegas? [RDLV] We have to put role models in front of young people that they can respect. My own biggest challenge happened when I was in high school. I was working in a sewing machine factory and got promoted. I could buy a car and I had money in my pocket. I thought this was success. I didn’t know what a difference education could make, or what success really was. You can achieve your ambitions in this country, but you have to make a plan, get the education you need and work hard. The worst thing you can do is tell kids they can’t reach high. Ask yourself: How many lives can [you] touch and change? My school counselor advised me to become a mechanic, and I was actually on that path. But my grandmother told me if I wanted to be an engineer, I could be an engineer. It was a light bulb that went on in my head. Instill pride in kids and raise their hopes that they can reach their full potential. In the book, this inspiration is what I combine with good common sense about how to make it in corporate America. [Pe] Sometimes big organizations don’t tell employees when they are being tested. How can future managers find opportunities to show their strengths? [RDLV] The chapter in the book, ‘The Five Levels of Leadership,’ has some very good tips about how to move up the staircase. You shouldn’t be afraid to be original. Sometimes you have to take risks, and also fill in what I call the ‘yes-but’ attributes you’re missing. In my own case, I was trained as an engineer. I never learned anything about how to speak in public. I recognized this weakness, so I joined the Speakers Bureau, practicing on anyone who would listen to me. Eventually, I became so good that I now enjoy doing it. It’s finding out what qualities you need in business and then having a plan to take those ‘yes-buts’ away. Whatever you can do to enhance your education gets you closer to your dreams. [Pe] Have you ever felt that your nationality or ethnicity was an obstacle? [RDLV] I always say the right way to deal with prejudice is not to let it prevent you from doing what you do best. It’s a distraction, and I don’t let it distract me. When I started working at BellSouth, I didn’t want to take an assignment in Latin America. I didn’t want to be labeled. I had to make sure, first, that I established my credibility by showing what I could do as a leader in Mississippi, in Alabama, and then take the international position. I want people to see I am a great engineer or a great leader first, who also happens to be an American of Cuban descent, not the other way around. [Pe] What opportunities and challenges will the telecommunications industry face in the future? [RDLV] Telecommunications is a wonderful, wonderful industry, and we have only begun seeing the tip of the iceberg in this revolution. For young people and entrepreneurs there are huge opportunities in communications, not just in this country but throughout the world. Broadband can bring education, medicine and markets to people in ways we haven’t even thought about yet. As we experience more and more of these new technologies, broadband will dramatically change the ways we live and work, forever. By Miriam C. Jacobs in INTERVIEWS, LOCAL HEROES on October 1, 2009 .